In just seven days, my flight will be landing at Reagan National Airport for my very first visit to the Nation's Capitol. When I bought my flight, I chose a very early time because I fully intended to make it to the Reason Rally. Then my tendency for bad luck struck again when I received an email that my connecting flight was rescheduled to a much later time. Figures, right? Oh well, I found that pouting for a few hours helped me cope. But now, as luck would have it, the schedule for the Reason Rally has also been extended from 10am to 6pm. I should be able to get from the airport to the National Mall to cover at least a few hours of the rally on my blog! 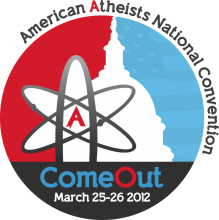 Also, next Sunday and Monday look for coverage on my blog from the American Atheist National Convention in Bethesda, MD. I'll be spending both days covering lectures by David Silverman, Greta Christina, PZ Myers, Jerry DeWitt, and of course, the keynote speech given by Dr. Richard Dawkins.